Investing in real estate is a milestone in every household. It is a strategic process that demands a lot of research and analysis. However, when it comes to making the biggest financial decision of your life, the real estate brand you are planning to invest in plays a huge role in determining the success of your venture. Apart from it being a prestigious affair, buying a property based on the brand value of the developer offers you a multitude of benefits worth considering. Few of them are mentioned below. A well-renowned real estate brand gets its prestigious status only by the impeccable track record of high-quality homes it is known for. Apart from top-notch construction quality and world-class amenities, a branded developer will also offer you with a variety of projects in different locations to cater to all types of customers. They also offer a plethora of options in the types of projects available for home buyers to invest in, from plush villas and row houses to affordable yet luxurious apartments. The array of choices provided coupled with the credibility of the builders gives you utmost customer satisfaction and assured return on investment. A reputed real estate brand gives paramount importance to customer service. A happy customer base is what makes an organization grow so a branded developer is guaranteed to not disappoint. As a good practice, you can analyse a real estate brand by conversing with family and friends who have already invested in them. Additionally, there are an abundance of property review websites which give you a closer insight into the integrity of a branded developer and the trustworthiness they are known for. The biggest advantage offered by celebrated real estate developers is the legal assurance they provide with all their properties. You can invest in them with uttermost confidence and indulge in hassle-free transactions that benefit both the home buyer and the property developer. Well-known real estate brands will be officially registered under the central government and state authorities. They also genuinely abide by the Real Estate Regulatory Act (RERA) and make sure your property is legally clear before the handover. They also provide maximum clarity on the taxes and duties payable while buying a home with due importance given to the impact of GST on the real estate sector. A branded real estate development company is known for the years of experience and knowledge they have in the industry. They are the trendsetters who have created a benchmark in the business of construction. 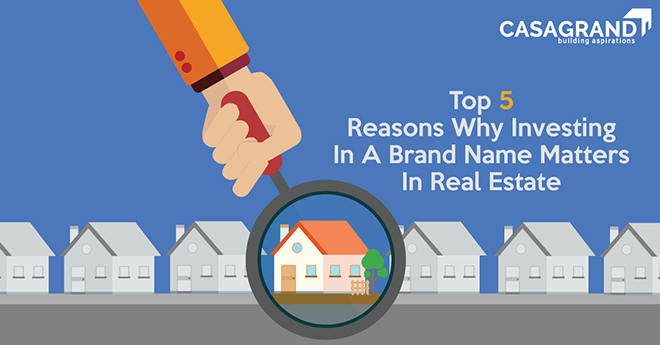 Furthermore, these real estate brands leave no stone unturned to live up to the reputation they have built over the past decades. From property development exhibitions to print and digital advertising, their credibility is showcased in every platform making investing in them the best decision to make. The biggest challenge most real estate developers face is the herculean task of handing over the property to home buyers on time. Timely hand over plays a pivotal role in building the brand and reputation of a company. Casagrand, the most prestigious name in the Indian real estate industry, is known for completing all its projects on time, every time, with top-notch amenities and facilities of international standards. Investing in a branded property not only gives you security and satisfaction, it also guarantees high construction quality and comfortable living for yourself and your family. Check out Casagrand for luxurious apartments built in the heart of Chennai, Coimbatore and Bangalore.